One of the most gripping novels I have read this year. Prepare for Kelly to become master of your imagination. Something about the cover, blurb and title of this book has excited me ever since I saw it appear on the Richard and Judy Summer reading list this year. The offer of scandal and mystery proving all too tempting. In an unprecedented reading spree I flew through the delectable pages of Erin Kelly’s debut novel this weekend, and now I can’t wait to tell you all about it. When the reticent, straight laced Karen meets the wild, bohemian and instantly fabulous Biba at a college notice board she is immediately captivated and infatuated by the energy and free spiritedness of this young, beautiful aspiring actress. For years Karen has done exactly what is expected of her, got the right grades, gone to the best college, dated the ‘perfect’ boyfriend. And yet something always felt missing. Karen has lived in a state of apathy and the sudden rush of Biba into her life gives her a taste of excitement, rousing her from her dull and structured life. The excitement that Karen feels upon meeting Biba, and her subsequent need to be a part of her life is contagious and I found myself urging Karen to seek Biba out, to immerse herself in her world. On the cusp of her first exciting, carefree and reckless summer Karen bubbles with anticipation for the long, hedonistic months ahead, and the feeling electrifies the novel. But just how much will this perfect summer cost Karen? Can she really lose her innocence and inhibitions without anyone getting hurt? From the very first pages Kelly plants a seed of doubt, she nourishes it with mysterious hints to a tragic accident and lost lives. Cryptic clues pile on top of ominous suggestions; prepare to be on the edge of your seat throughout this novel. I wont give away too much of this novel, I don’t want to spoil it for a first time reader, especially since I felt a deep sadness upon finishing it as I realized I was now robbed of ever reading it with fresh eyes. But needless to say from start to finish it flows with a sense of intrigue, crackles with anticipation and delights with a heightened sense of drama. After Karen’s first chance encounter with Biba an instantaneous friendship is sparked and soon Karen is leaving her stringent, stuffy home which she shares with her overtly organized flat mates to live in the eccentric, messy but wonderfully captivating home of Biba and her brother Rex. A crumbling town house which defecates the perfectly manicured homes lining the rest of the affluent street in Highgate. But this is exactly what attracts Karen, she craves a life far removed from the order and predictability that she has become accustomed to. Abandoning her previous home Karen encapsulates the innocence and vulnerability of someone desperate to shake off her shackles, of course this indeed leaves her blind to the dangers around her; the dangers that Kelly slowly and tantalizingly pertains to. Desperate to immerse herself in the abandon of Biba’s world Karen soon finds herself falling into a family whose past is as murky and deeply rooted in obscurity. But all of this must be learnt along the way and Karen moves swiftly in, without ever looking back. Kelly adds an extra edge of suspension to the novel in the form of her fleeting narrative which switches from past to present. In the past we learn about the events that shaped that tragic summer spent in Highgate, in the present we join Karen as she lives her life ten years on in Surrey. She describes her life as being entirely different in the present, indeed it is clear how deeply that irrevocable summer has shaped the woman she is now. Cagey, protective and always afraid and looking over her shoulder, but what is she afraid of? And even more mysteriously, Karen is now living with Rex, Biba’s older brother; the taciturn and overly protecting man that at first threatened to spoil the reckless fun that she hoped would shape her summer. The tension of the novel boils as we switch back and forth in time. Questions piling up along the way, why has Rex being in prison, how did he and Karen end up marrying and having a child together. What happened that summer and why is Biba missing from the present day? As the story wears on the truth begins to reveal itself only for more clandestine secrets to present themselves. One thing is for sure Rex surely seems to know the capabilities of Biba’s wild abandon and he alone fears the consequences of her actions. When Biba brings home Guy an arrogant drug dealer with a murky background both Rex and Karen find themselves fearing the worst. What will this trouble maker do to the perfect equilibrium that Karen has just so recently found? When I finished this book I was literally left quite speechless, a book hugging moment might have been a little inappropriate given the dark nature of the novel, but I loved it all the same. Now I’m desperate to try her next novel the Sick Rose. 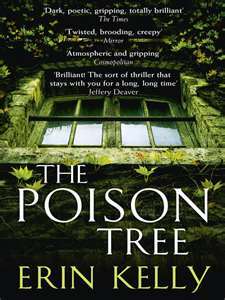 if Kelly can weave the same magic on me as she did in The Poison Tree then I think I will have found a new favourite author. Have you read either The Poison Tree or The Sick Rose? If so what did you think? Or have you heard of this book but haven’t quite got round to reading it yet, but want to? Either way I would love to hear all of your thoughts. It would seem Fforde’s imagination knows no bounds in this thrilling and truly original story. 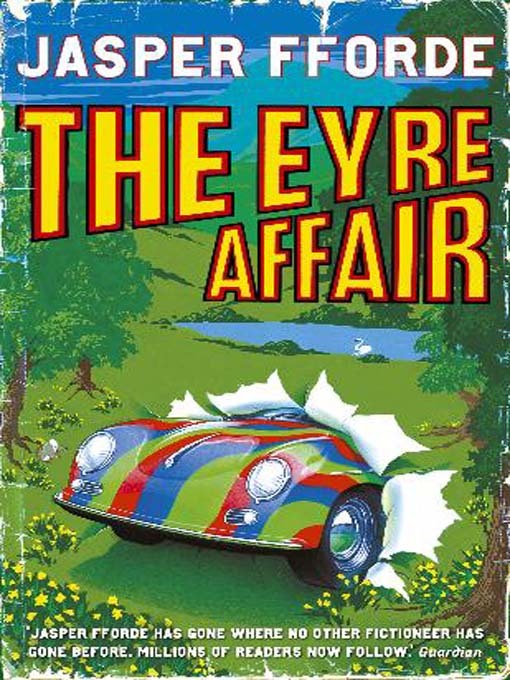 From the first pages of the book Jasper Fforde immerses us into his wonderfully imaginative and colourful world where time travellers can span decades, dodo’s are kept as pets, and the Crimean war never ended. All of Britain is controlled by the over bearing Goliath corporation who use bully boy tactics to get what they want. But at the heart of the novel is Fforde’s greatest creation, his heroine Thursday Next. A spunky, brave and pragmatic young lady who thrives in exciting but dangerous tasks. 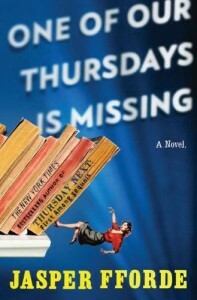 Unfortunately for Thursday she is stuck in a rather dull job, working as a literary detective in Spec Ops. It’s Thursday’s job alongside the other lit detectives to prevent crimes against plagiarism, forgery and the theft of great literary works. Fed up of this musty, dull world, Next craves a new adventure. But when the Charles Dickens’s Martin Chuzzlewit manuscript mysteriously vanishes along with one of the books minor characters, Next soon has all of the excitement she wanted…and a whole lot more. Suspicions of the manuscripts theft soon turn to the books super villain Acheron Hades who seems to be the only person powerful or evil enough to not only steal such a great masterpiece but to also do it without leaving so much as one trace of himself at the crime scene. Even CCTV fail to bring up the faintest shadow of him. Thursday and her comrades must now fight a race against time to try and recover the manuscript before anymore damage is done, and they must capture the merciless Hades whose seemingly superhuman powers are beginning to manifest themselves in frightening ways. But as the drama mounts so do the casualties and a nasty run in with Hades has serious consequences. So when Jack Schitt from the Goliath corporation begins to poke his nose into the whole Hades affair, in spite of his ascertain that Acheron is dead, the pressure becomes even more heavy for Next. Hot on her heels Schitt proves another level of thrill and drama for this already powerfully imaginative novel. In a world were ‘time waits for no man’ and were the boundaries of reality are blurred; nothing is impossible. When the original manuscript of the nations beloved Jane Eyre goes missing in much the same manner as the Martin Chuzzlewit manuscript the novel is at fever pitch. On the cusp of victory Next must leave this world and enter the world of Jane Eyre, but will our heroine get back, and who will be in there with her? Well that’s as much as I’m going to tell you, I don’t think I’ve given anything essential away, although my synopsis might seem a little like it. The book is filled with so many surprises and adventures you wouldn’t think imaginable until you actually read them for yourself. By the end of the book I was quite literately on the edge of my seat desperate to see how things would pan out. Although I will confess to finding the ending a little hurried, has anyone else read the book, would you agree or disagree? Hurried ending aside I did enjoy this book immensely. I found the narrative smooth and natural allowing me to totally sink into Fforde’s fictional world. I found the book amusing, the amazing power of Fforde’s imagination blowing me away at times. I found the style and plot of the book rewardingly original. All of this said I also quickly forgot the magic of The Eyre Affair. That probably sounds quite harsh doesn’t it? But for me a book like this with such rich imagination should surely be quite unforgettable. I’ve read other peoples reviews and thoughts and they seem to have become so engrossed in this other world that they are still now talking about a world were litera tech’s work, Wales is a republic and dodo’s walk the street. So powerful the book seems to have been for them that they are still clinging onto that other world. I think that happens when you read books set in alternative worlds or countries. It’s rather clichéd I’m sure, but when I read Harry Potter for example, or The His Dark Material’s trilogy I really got lost in those worlds, and if I close my eyes now I can totally convince myself that I’m in Hogwarts. Perhaps what I’m saying is I expected this to be more epic, or to have more of an epic impact on me. As it was I enjoyed the book for what it was, a fast paced book with humour, wit and strong imagination. The after effects though were less impressionable and now I’m left with a book that yes I would recommend, but no I wouldn’t call it one of my all time greats. Maybe I’m being a little unfair and from the offset was looking for the wrong thing, what do you think? Have you read the Eyre Affair, were you blown away by it or were your feelings mixed? I’d love to hear your thoughts.